Experience the ultimate in luxury at this unique villa, designed by renowned architect Michael Upwall. 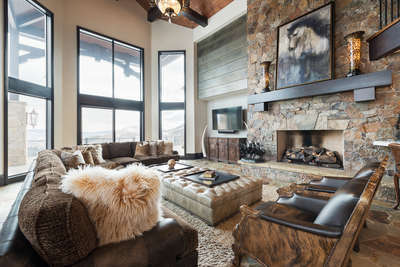 Located in the exclusive gated community of Deer Crest on the slopes of Deer Valley Resort, this ski-in ski-out home offers 8 357 square feet of indoor living space and more than 3 000 square feet of deck and patio space, making it an ideal getaway for family vacations, corporate retreats or getaways with friends. Amenities include nine gas fireplaces, a spectacular glass elevator, earth stone pizza oven, wet bar, wine room, home theater, sauna and private outdoor hot tub. Spectacular glass elevator, washer and dryer on each floor, earth stone pizza oven, wet bar, wine room, home theater, five additional TV's, game room, office, nine fireplaces, sauna, private outdoor hot tub, outdoor fire pit, barbecue with rotisserie, and heated two-car garage. Enjoy stunning views of Lake Jordanelle and surrounding mountains.